The REserviceS project – Economic Grid Support from Variable Renewables- is coordinated by the European Wind Energy Association (EWEA), and supported by Intelligent Energy Europe – IEE. The OPTIMATE project – Model for Pan-European Electricity Markets- is coordinated by Technofi and co-financed by the Seventh Framework Programme – FP7. Please find screenshots here and here. The Beyond2020 project – Design and Impact of a Harmonised Policy for Renewable Electricity in Europe – is coordinated by the Technical University of Vienna and supported by Intelligent Energy Europe – IEE. The GridTech project – Impact Assessment of New Technologies to Foster RES-Electricity Integration into the European Transmission System- is led by the Technical University of Vienna and co-funded by Intelligent Energy Europe – IEE. The e-Highway2050 project – Modular Development Plan of the Pan-European Transmission System 2050 – is coordinated by RTE France and co-funded by the Seventh Framework Programme – FP7. The TWENTIES project – Transmission System Operation with Large Penetration of Wind and other Renewable Electricity Sources in Networks by means of Innovative Tools and Integrated Energy Solutions – is coordinated by Red Electrica de España and funded through the Seventh Framework Programme – FP7. 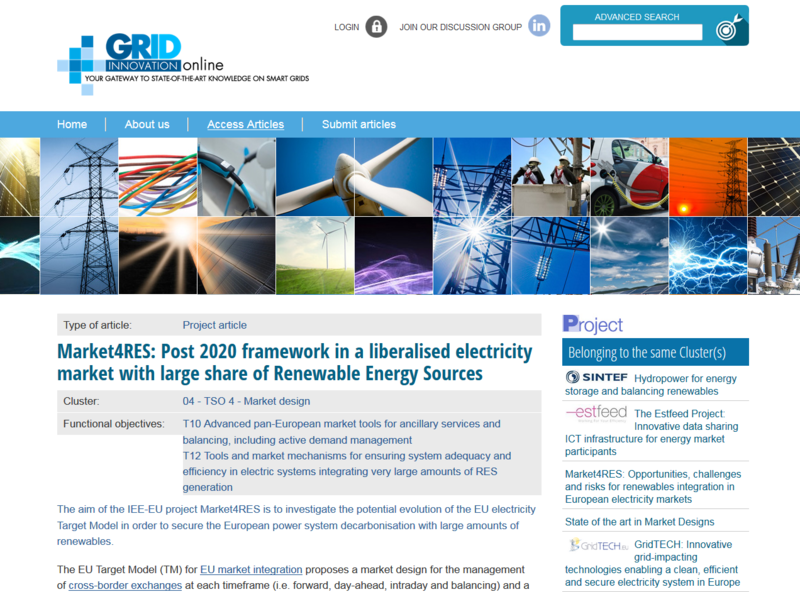 The GRID + project – Connecting SmartGrids Initiatives, Moving Towards 2020 – is led by Ricerca Sistema Energetico (RSE) and supported by the Seventh Framework Programme – FP7. Please find a screenshot here. Gridinnovation-on-line platform, developed in the framework of the GRID+ project. The ELECTRA project, led by Ricerca Sistema Energetico (RSE) and supported by the Seventh Framework Programme – FP7. The EcoGrid project, led by SINTEF Energy Research (SINTEF) and supported by the Seventh Framework Programme – FP7.